Dry. Savannas, upland deciduous forests, sandy plains. Shade intolerant. This is a moderately fast growing, moderately long-lived, deciduous tree rising on a single trunk from a deep taproot and deep, widely spreading, lateral roots. In Minnesota mature trees are usually 40′ to 60′ tall and 18″ to 24″ in diameter at breast height, though individuals can reach over 70′ in height and 43″ in diameter. The crown is open, rounded, and irregular. The branches are small. Lower branches are drooping. Stubs of dead branches on the lower trunk often persist for a long period of time, giving the trunk a ragged appearance. 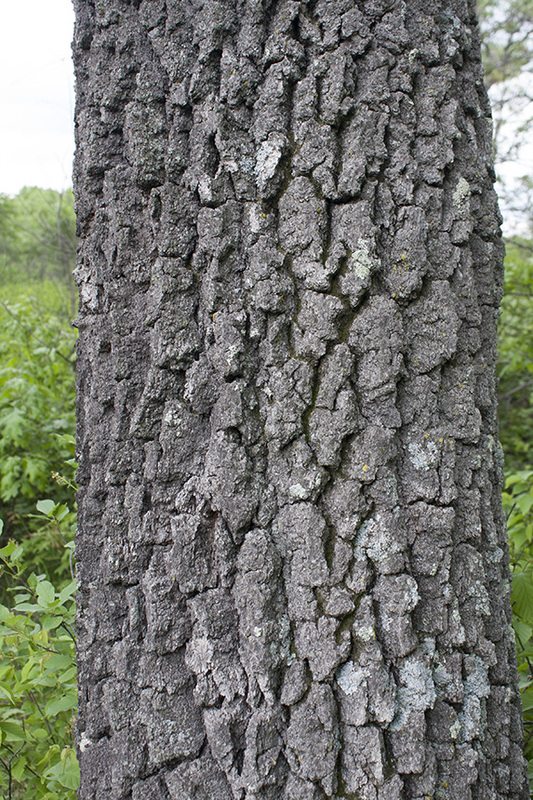 The bark on young trees is dark grayish-brown to grayish-black, and smooth. 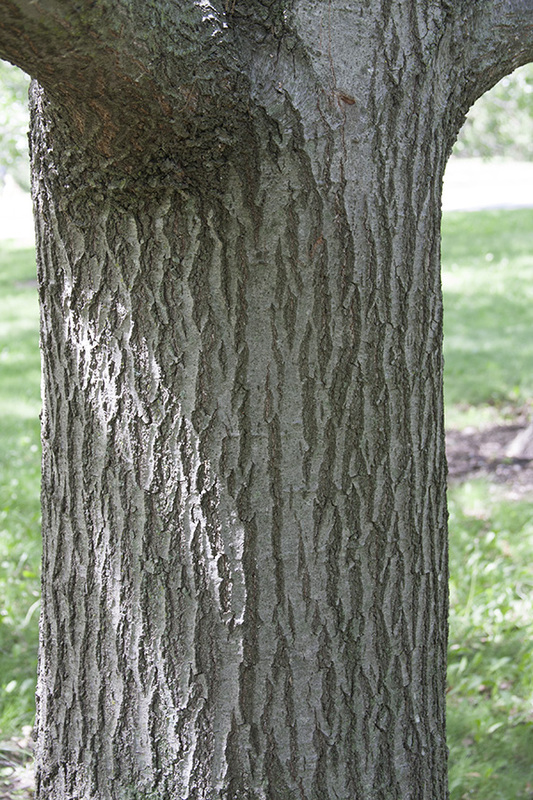 On mature trees the bark is thicker and gray or grayish-brown. It is broken into short, rough, slightly blocky ridges separated by shallow furrows. On older trees it is rougher and breaks into irregular segments. 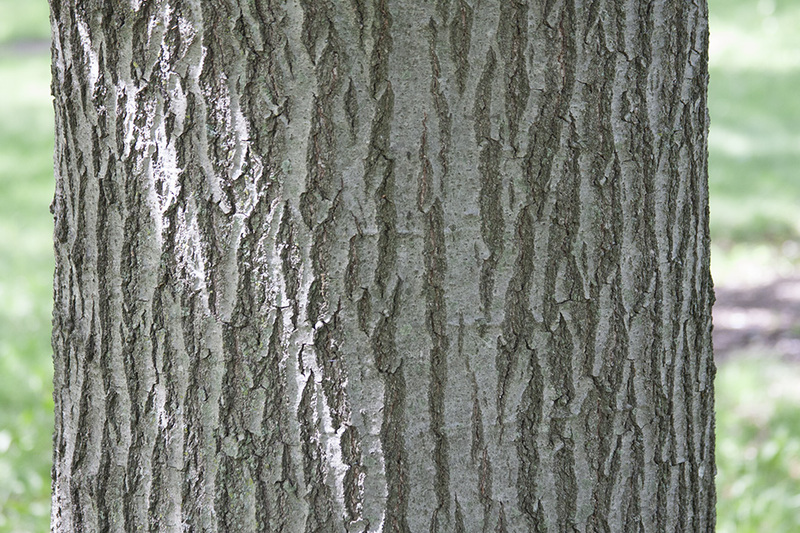 Inner bark is light yellow. 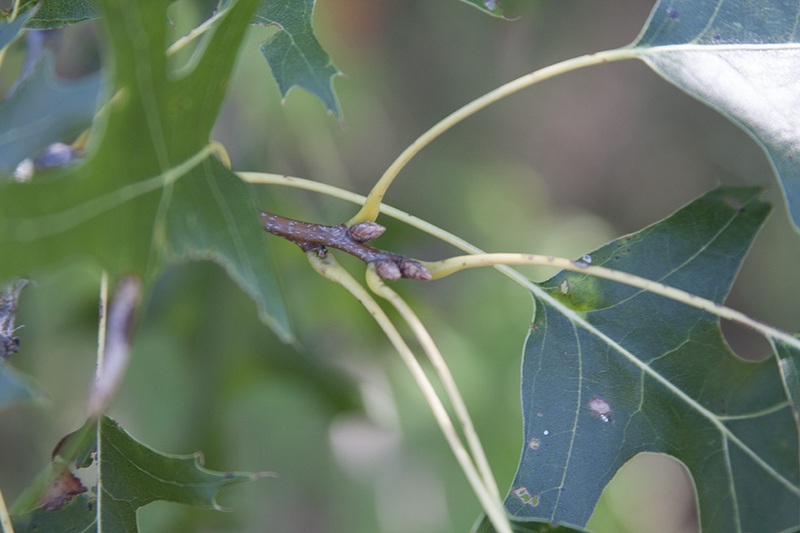 Twigs are dark reddish-brown and hairless. Terminal buds are dark reddish-brown, egg-shaped, conspicuously 5-angled in cross section, and ⅛″ to 3 ⁄16″ long. The scales near the tip are covered with silvery or tawny hairs but the buds are otherwise hairless. They are surrounded by a cluster of lateral buds. 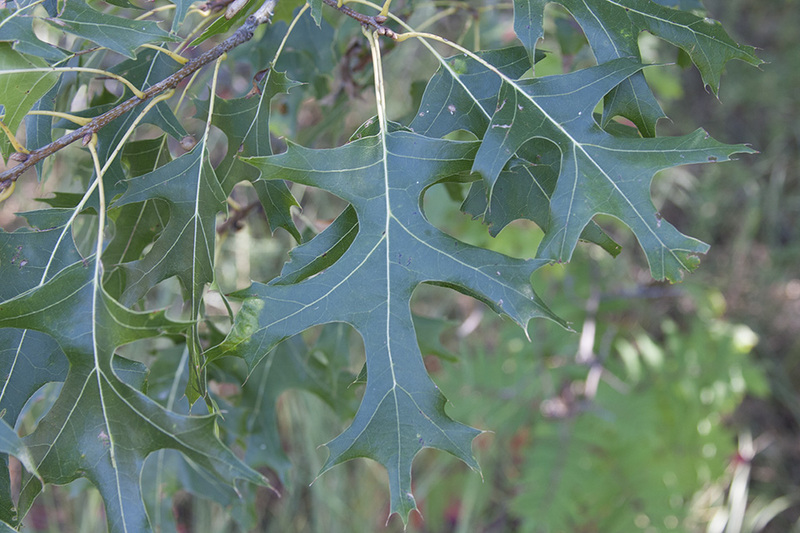 The leaves are alternate, elliptic in outline, 2¾″ to 5½″ long, and 2½″ to 5″ wide. They are on hairless or almost hairless, ¾″ to 1¾″ long leaf stalks. The leaf blade is broadly angled or nearly squared off at the base. There are 2 or 3 primary lobes separated by deep, U-shaped sinuses and 9 to 22 smaller, bristle-tipped, secondary lobes per side. Most of the sinuses extend more than half way to the midrib. The deepest sinuses extend 65% to 90% of the way to the midrib. The upper surface is dark or light green, shiny, and hairless. The lower surface is pale green, hairless except for tufts of hair in the vein axils. In autumn the leaves turn deep red, yellow, brown, or purple. Male and female flowers are borne on the same branch. Male flowers are in slender, greenish, 1½″ to 4″ long catkins that hang downward from buds on branchlets of the previous year. Female flowers are bright green and appear singly or in clusters of 2 or 3 on a short stalk rising from leaf axils on branchlets of the current year. The flowers appear after the leaves in early May to early June. The fruit is an ellipsoidal or egg-shaped, ½″ to ⅝″ long, 5 ⁄16″ to ½″ wide acorn. It occurs singly or in clusters of 2 or 3 on a short, stout stalk. A deep, scaly, bowl-shaped cup encloses ⅓ to ½ of the lower part of the nut. The scales on the cup are flat and the tips of the scales are tightly appressed. The inside of the acorn cup is hairless or, rarely, has a ring of hairs around the scar. The acorns stay on the tree for two growing seasons. The kernel is yellow and tastes very bitter. It ripens in mid-August to mid-September of the second year. 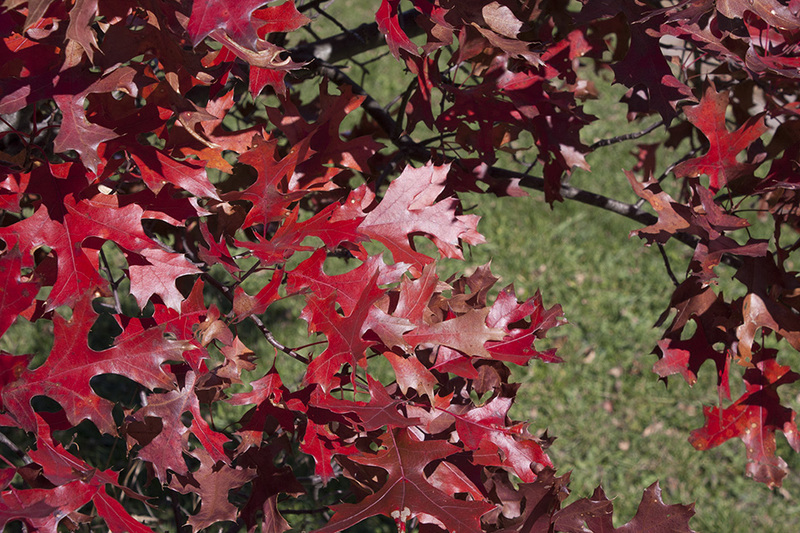 This species is often misidentified as scarlet oak (Quercus coccinea), but that species does not occur in Minnesota. 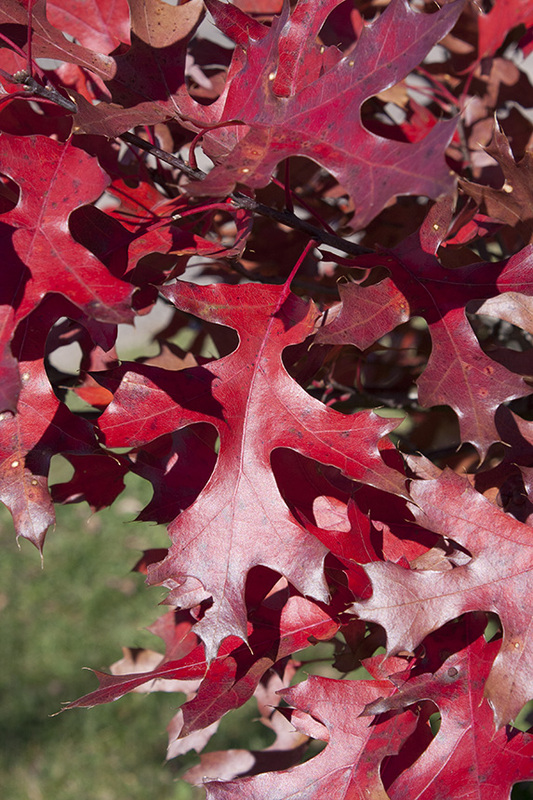 Eastern pin oak (Quercus palustris), a non-native tree, has deeper, wider sinuses. It does not occur in Minnesota. 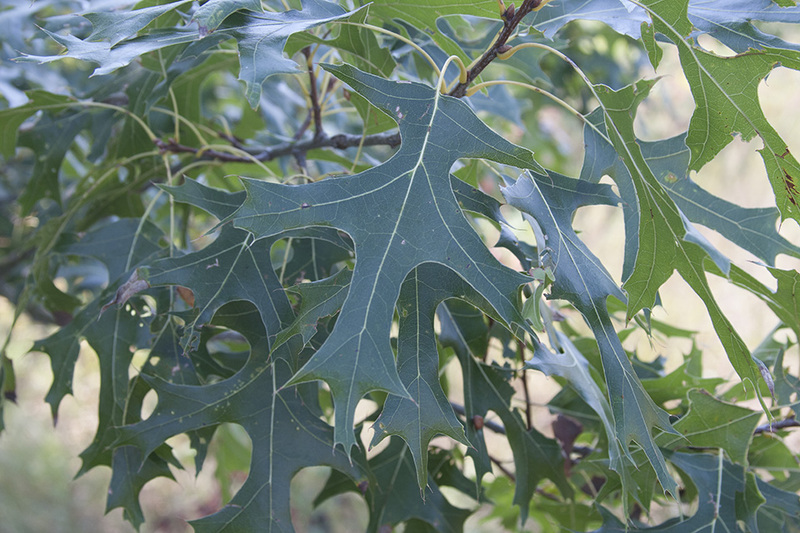 Northern red oak (Quercus rubra) has mature bark broken into long, pale gray ridges that have the appearance of ski trails. Terminal buds much larger and are round in cross section, not 5-angled. The leaf stalks are tinged red or mostly red. The leaf blades are less deeply lobed. Most of the sinuses extend less than half way to the midrib. The deepest sinuses extend 45% to 70% of the way to the midrib. The upper leaf surface is shiny. 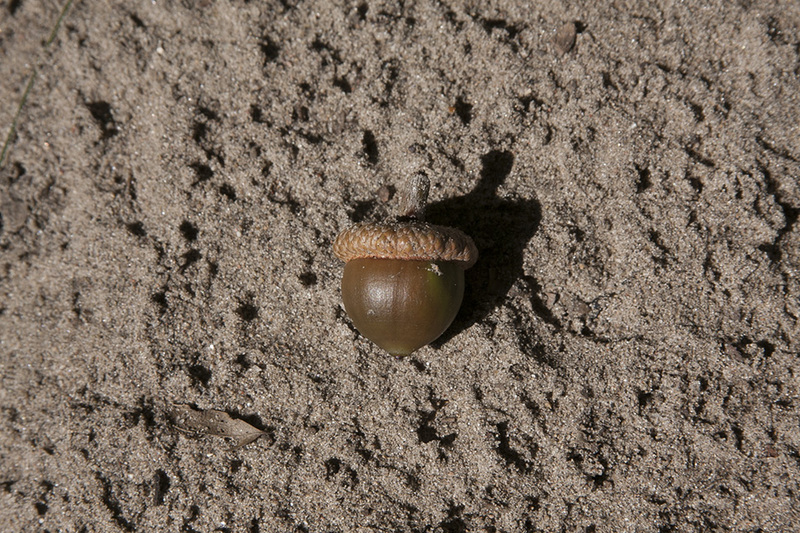 The acorn is larger, ⅝″ to 1″ long. The kernel is white. Distribution Sources: 2, 3, 4, 5, 7, 8, 28. 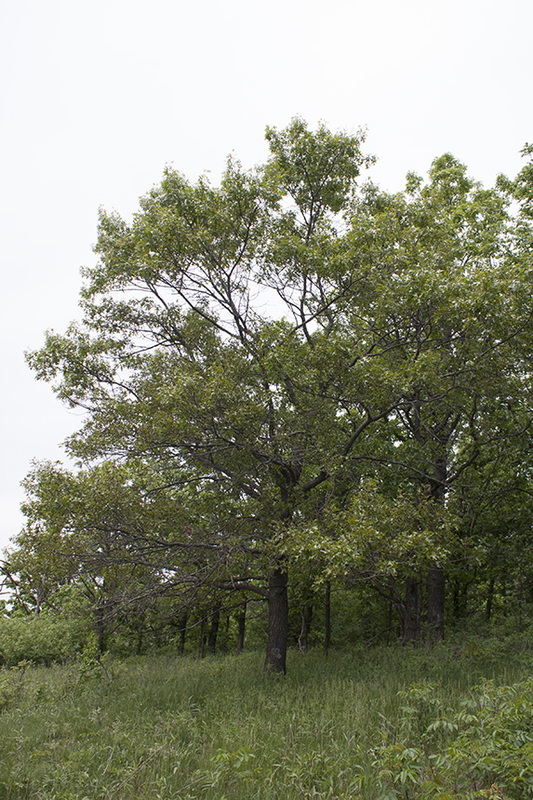 The champion northern pin oak in Minnesota is on private property in Caledonia, in Houston County. In 2013 it was measured at 97′ tall and 143″ in circumference (45½″ in diameter). The upper angle where a branch, stem, leaf stalk, or vein diverges. A slim, cylindrical, drooping cluster of many flowers. The flowers have no petals and are either male or female but not both. 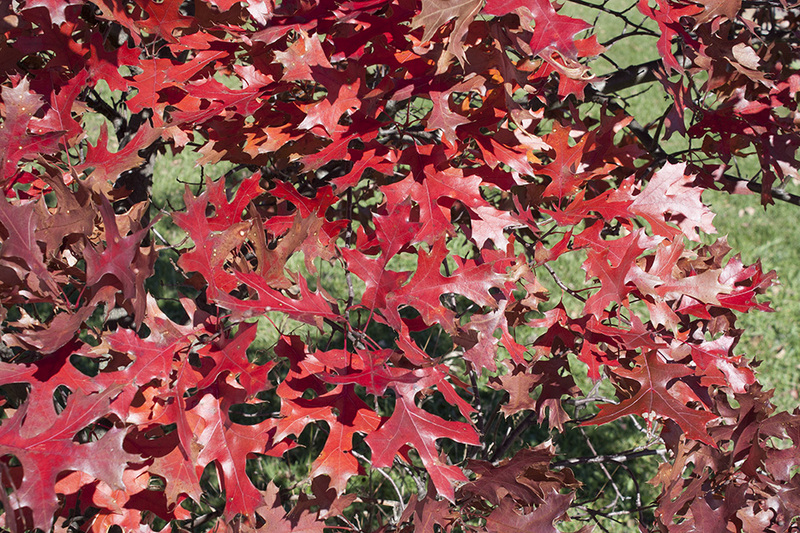 http://www.tytyga.com/Pin-Oak-p/pin-oak-tree.htm The Pin Oak tree is known as a top favorite among the shade trees. 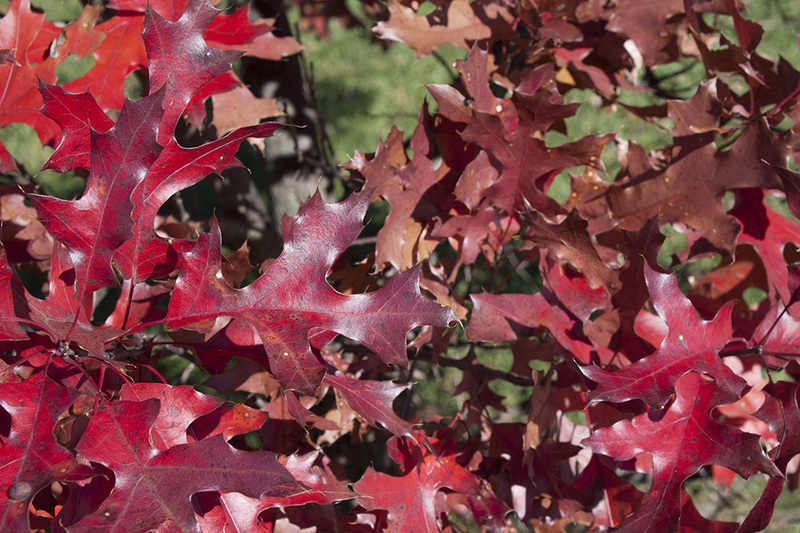 The color of the fall leaves in the Pin Oak trees is among the most dramatic and spectacular, and the acorns from pin oaks are abundant and loved by wildlife animals and game birds.